A recent addition to my wardrobe, the iconic M-65 field jacket. Tracing its origins back to the the US Army's WW2 M-43 field jacket, though with velcro collar tabs and cuffs, the M-65 is, I would say, the single most worn outergarment in Poland. I counted three in the supermarket yesterday, four on trip to town last week. Plus dozens of lookalike jackets inspired by the M-65 (also with four cargo pockets, drawstring waist and hem, and epaulette straps). The M-65 is usually in olive drab, and also in a variety of camouflage patterns, black, navy or white. I've had a white one for over 20 years, though without the liner. It's the removable quilted liner that makes this jacket ideal for the Polish winter. In the few months I've had it, I've been for many long walks in sub-zero temperatures and not felt cold, nor overheated. Widely available from army surplus shops, Domy Harcerza or Militaria.pl. I paid 169 zł for mine last October (around 40 quid). Another US military outergarment that's less often seen in its original, but widely imitated and very popular, is the 'Jacket, Flying Man's Heavy Attached Hood N-2B'. 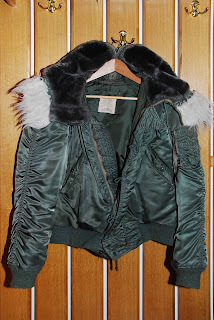 This bomber jacket has a high waist, large 'snorkel' hood which can zip right up and keep the head snug (though lateral visibility is limited). In Poland, imitation N-2Bs tend to be worn by women, although these are smaller than the real thing (which is quite heavy). I bought my one in December 1980, while still a student - costing the princely sum of a hundred quid. It has served me well, especially after moving to Poland, where it's ideal for driving cold cars first thing in the morning. 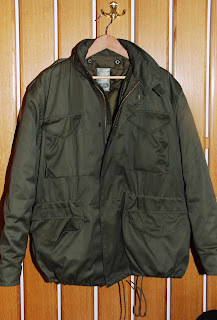 The N-3B parka is the coat-length version of the N-2B. Again, replicas and imitations abound; few originals to be seen (unlike the ubiquitous M-65). I guess Poland's not quite cold enough for real arctic weather gear. UPDATE: to prove my point. I went for a late lunch at the Vietnamese place round the corner from our office. I was the only person eating, when a big guy in his mid fifties walked in... also wearing an M-65 field jacket. Warsaw's unmade roads: what's to be done?